So I did not forget that is was Thanksgiving. I am thankful for so much but between my computer crashing, a busy holiday weekend with friends and family, black friday shopping, Christmas tree trimmung, and a frustratingly slow netbook, I haven't had the time to post. I could ramble off a list a mile long of things that I am thankful for. It has been a very blessed year. I promise not to give you the whole list but I do want to highlight several things in my life that deserve recognition. The first is the health of my family. This year could have ended very differently after the misdiagnosis of my sons appendicitis. I am so very thankful that God protected my little boy and spared him from sepsis and a much worse outcome! My God is so very good! This year was also a year of transition. About this time last year we put our home on the market and trusted that God would provide our family with a more handicap friendly home for Makenzie. In May with the help of our family and community God gave us the perfect home that meets the needs of each member of this family. I am so thankful for a house without stairs. I am so thankful that my little girl came be in every room of our house. I am so thankful that my boys each have their own room and a place to hang out with their friends. Yes, friends. I am so thankful that ALL of my kids have made some good friends and are also doing much better at their new schools. I am so thankful for God's perfect plan and hand in our move! I am so thankful for Makenzie's therapists. This year has been a year of healing for Makenzie and each and every one of her therapists has helped Makenzie grow. I am thankful for good medical insurance. A medical insurance that not only pays for Makenzie's daily therapies but her medical equipment as well. In the course of this year we have ordered the aspen seat with the zippie base, a power chair, bath chair, talker, kidwalk walker, Taos orthopedic walker, and car seat. There were a few denials but all in all getting approval has been very painless. I am also oer the moon thankful for Makenzie's school. I have finally found a team that gets it. They understand how to integrate Makenzie. She has friends and is learning so much. When I think about the last 3 years of fighting to get Makenzie in school I know that at this point I could ask for nothing better! Oh how thankful I am for a great school and team for Makenzie! However, I think the one thing that stands out in my mind the most this year as an item of thanksgiving is the healing God has given to Makenzie in the area of physical growth. This year Makenzie gained just over 6 pounds. Considering it took her 3.5 years to gain 10 pounds, six in one year is amazing! Even better then her weight is the fact that vomiting is mostly a word of the past. I feel like I should knock on wood because anytime I mention how well Makenzie is doing in this area we have a set back. Makenzie still has reflux that is very much under control with medicine. Just like the rest of us when she gets sick she tends to have more tummy issues but on a daily basis she is tolerating about 9 ounces of blended formula 3 times a day at about 400cc's an hour! I have gone as fast as 600cc's in an hour and Makenzie also does just fine with that rate as well! Now that is a HUGE miracle!!!!!!!! This healing has made life so much easier. It has removed many limitations and given me much more time in my day. I worry a LOT less about so many things! Really there are not words that can really describe how thankful I am that I can feed my daughter, that it stays in her stomach, and that she is not in constant pain after eating! To God be ALL the Glory! a huge THANK YOU to all of my friends, family, local community, and all of you, who continue to pray for Makenzie, offer support, and walk down this road with our family! I could go on and on.... really but it is now 6 am and my day is about to start getting crazy! Have a great Tuesday and Happy belated Thanksgiving! It is 1:33 am. I am wide awake. Something new and amazing has been happening for the last several months. Something that I have missed for a very long time. Makenzie has bcome able to fall asleep cuddled up next to mommy on the couch instead of needing complete dark, utter silence, and loud white noise to lull her off to sleep. It is amazing.... I think I said that already. Tonight Makenzie cuddled up next to me and we both fell asleep on the couch until after midnight. I laid her in bed, started her water, gave meds, and now I am wide awake. It was so worth it! Life around here has been a bit crazy. Today was moving day for Makenzie's OT. We said our goodbyes this afternoon which was very hard. I don't think it will fully sink in that she is gone until Monday when she doesn't stroll through our door at 1:45 ish! I am sad but it really isn't goodbye because Stephanie is way more to our family then an OT and we will continue to stay in touch and I can't wait to see Makenzie walk down the aisle as a flower girl in her wedding this March! So see ya later is more fitting! I see much facetime in our future. We met once with Makenzie's private speech therapist and the school therapist to talk about programing, communication strategies, data collection, and goals. We decided to change a few pages from 12 buttons to 20 because Makenzie is doing so well and needed more space for additional vocabulary. We also decided to define some navigation rules and a navigation page to give Makenzie the choice of what page she wants to go back to. So yesterday I spent a LOT of time with my face buried in Makenzie's talker. Programing, reprogramming, and thinking about the organization of all of the pages through over and over. My head hurt but at the end of the night I had a product that made sense and will be very helpful as more vocabulary gets added to Makenzie's talker. This afternoon we met again at the school with the Dynavox rep. The talker the District bought for Makenzie was at the school as well. We loaded Makenzie's user area into the talker and the rep went over the ins and outs of how to operate the features of the talker. This is where I disagree with Dynavox and some of the training they are giving to their reps. Some of the following information will not make sense to those you if you do not have experience with eye gaze access..... sorry..... bear with me. I have heard over and over from the rep and Dynavox's tech support that the device needs to be re calibrated often. I strongly disagree. The user's eyes need to be re tracked often but the camera itself does not need to be re calibrated unless the eyes are tracked, the camera is reading them, and the talker is not responding appropriately. Then and only then does the calibration need to be addressed. The other idea I disagree with is that the calibration number does not matter. After much experimentation and experience I can tell you it very much DOES matter. If the calibration is not good the device can be accessed but may not be choosing what the user is actually looking at. I tried using one of Makenzie's bad calibrations and after about 3 minutes of looking at one thing and the talker selecting something different I had to stop because I got so frustrated. Then recently I accessed Makenzie's talker with her good calibration it was a night and day experience. Even though it was not set to my eyes I could pick what I was looking at very easily. Now that the school has their own talker that Makenzie will be using all of this information has become very important. I have tried to my best explain why I want Makenzie's settings on her talker at school to remain unchanged. It seems though that this request has been met with a some what defencive mood. This afternoon a very frustrated therapist told me I needed to understand that they will be addressing her settings at school if needed. The issue I have with this is that if they go with the "camera needs to be re calibrated often" theory Makenzie is going to be subjected to much undue frustration with the calibration process as there is nothing quick nor easy about achieving a functional calibration with Makenzie. It took Makenzie and I almost 2 hours. If they go with the "calibration numbers do not really matter" theory. Makenzie will not have appropriate access to the talker which will set her back very quickly. Their talker or not, Makenzie is my daughter. This is not a fight. This is not about control. It is about a mom wanting the best for her kid. In order to achieve that I have spent a lot of time learning how to support Makenzie on her Eyemax. I have served the school a talker, which has near perfect settings, on a silver platter. What I don't understand is why they are so intent on fixing what is not broken and if it does become broken why they have such an issue with me being in charge of fixing it. I have proved to them over and over that I know how to do just that. I also know Makenzie best. This school has a mom who is willing and able to help. Instead of saying thank you, they would rather do it themselves. I don't get it. I will be checking in on the settings frequently. At this point there is nothing more I can do. All in all it is coming together. Makenzie now has a talker, a wheelchair mount is in process, and the school staff is getting some good training. I am happy with the progress. Makenzie could not have better support from the school SLP and the special ed team. I am also very proud of myself (yes I am tooting my own horn) for educating myself on the IEP process and Makenzie's rights and then being able to use that information to see this to the end for my girl! There are so many things in Makenzie's life that I can't fix but it is oh so rewarding when there are things that I can! I can't wait to see Makenzie grow and learn! Pretty wonderful stuff if I do say so myself! Today we had another IEP meeting. Today we talked about Makenzie's talker, her mount, and what needs to happen over the next 5 years to keep the talker working properly. I have begun to really hate these meetings because I love Makenzie's school. I have tried to really hard to to be level headed. I have tried to compromise and work within the system. I have tried not to push too hard but at the same time hard enough to get Makenzie what she needs. I am an advocate. Sometimes being an advocate stinks. It means ruffling feathers of people that you really like. It means offending those that are trying to help you child. It means asking for things that are hard to get and the district does not really want to give. It means not taking no for an answer. It means speaking louder and louder until someone listens, it means disagreeing time and time again. It means standing your ground. It means offending when that is not your intention at all. It means compromising but knowing when there is no room for negotiation. It means knowing your child's legal rights inside and out. It means defensive professionals. It means feeling unheard. It means having an opinion that doesn't count because you are just the mom. It means many e-mails and phone calls and it means many many tears. Sometimes being an advocate for your child stinks. So this week ended with many of the above during another IEP meeting. This morning before the meeting I called our seating guy to ask him if a static mount could be put onto her chair at school. His answer was yes. I also called Dynavox and got information on their extended warranty. During the meeting there were feathers ruffled. There were defensive professionals. There was no room for compromise. At the end of the meeting the team had agreed to mount the talker to her chair. I gave them the info from the seating company and then we moved onto the warranty issue. Makenzie's talker comes with a year warranty that expires in October 2012. Dynavox offers extended warranties to cover any damage to the device after the first year. They are a bit pricey but not near as pricey as the talker itself. I asked that they pay for the warranty after the first year. Apparently they are going to do one better and provide Makenzie a district owned talker for her to use at school. I guess that is one way to fix protecting Makenzie's talker! I'll take it. Makenzie is in a class of her peers. She has twenty something 6ish year old friends that learn with her and are being unknowingly taught the amazing lesson of acceptance. They are changing Makenzie and Makenzie is changing them. It is one of the most amazing thing I have ever seen in my life. The Principal in easy to talk to and very available. He is never defensive and always understanding. He has gone to bat for Makenzie over and over. I have never ever meet a school administer who is so kind and willing to do what ever it takes. Then there is her classroom teacher who gets it. She includes Makenzie in all of the class activities. She has asked me to come help in the class and when I find a way to make it work I will be there! She is concerned about the sidewalks when it snows and making sure Makenzie does not feel left out when the other kids are eating their snack. She makes my girl feel special. Her aide. Well I have never ever met someone who does not have a child with severe special needs understand my daughter like she does. From the first time I met her I knew that she would be wonderful with Makenzie. She is a great communicator. She tells me each afternoon what Makenzie did and how her day was. She gets just about as excited as I do when Makenzie does something new and wonderful. She is doing an amazing job of learning how to incorporate Makenzie's talker into her day. She is teaching Makenzie how to learn and communicate. She works with what she is given to use and has a great job with less then adequate tools. She is protective and makes sure Makenzie is safe all day. She believes in Makenzie and lets Makenzie know this all day, everyday. Last but not least the nurse is amazing. I have never met a school nurse with so much knowledge and experience. She is one of the main reasons I do not worry about Makenzie while she is at school. God knew I needed someone as good as her to trust my beautiful daughter with. She cares, I mean really cares about all of her students. Makenzie is in the best medical hands while she is at school. There are many other people that work with Makenzie at school. I could be here all day but I have a meeting to get to across town. Now we wait for the mount to be ordered and put on Makenzie's chair. Once that happens Makenzie will be able really shine! Well I spent this weekend trying not to catch the stomach bug Makenzie came down with just as her cold was clearing up. On Sunday I was finally able to get her stomach to tolerate a bit of food, she had more giggles, and her smile greeted me with ease instead of forced hesitation. Yesterday morning when Morgan came, the first thing he did was throw up. Crap! Makenzie is such a good little sharer! I am so sick of sick. However, for today everyone seemed to be well and that was nice for a change. I have not posted about school for a while because it is really going very well. I LOVE the school from the administration all the way down. There has however been one thorn in my side and it is still brewing....... the talker, and everything that goes along with it. Before I begin I want to start with a disclaimer....... The rest of this post is not about the people involved in Makenzie's education. Each and every one of them is working very hard on Makenzie's behalf. Instead this is about a system that can be very slow and sometimes incredibly broken. When we moved I contacted the school in the beginning of August. At that time I knew that Makenzie would be getting an eye gaze communication system. No one was sure exactly when because of the insurance process. We did several evaluations so that the school could make their recommendations and at the end everyone agreed Makenzie needed the eye gaze technology. We had many discussions about the school providing a talker for Makenzie to use before we found out that Makenzie's personal talker would be arrive way sooner then anyone expected. I agreed to allow Makenzie's talker to be used at school but asked the school to provide a proper mount and charger to be used at school. This is where things started to get a bit messy. In order for Makenzie to access her talker she must be positioned very well. After that is accomplished the talker has to be placed 22 inches away from her face and the proper angle must be acquired by tracking her eyes in the little box on her talker. If you missed the post on how much fun doing this is is not you can find it here. The AT team at the school recommended a rolling mount. I expressed my grave concern over this idea for several reasons many times before the mount was ordered. A few of my concerns included the amount of time that would be spent re tracking Makenzie's eyes each and every time Makenzie or the talker moved. I also expressed concern over the frustration this would cause Makenzie, the amount of time it would take away from Makenzie's education and I also had secondary concerns about the logistics of transporting the talker and mount separate from Makenzie's wheelchair. We then had an IEP meeting where I expressed these concerns AGAIN. My concerns however seemed to fall on deaf ears over and over again and a rolling mount was ordered anyways. So at the IEP meeting I agreed to allow the school to conduct a trial period with the rolling mount because I felt that until I conceded to that plan we were going to be at a stand still on the mounting issue. I was willing to give it a go but not until after I made it very clear that I knew it was not going to work and I felt like precious time was being wasted. I want to be able to compromise and was willing to do so until yesterday. Yesterday I was unable to stay to help set the talker up in the classroom. So for the first time the school was going to h ave to set up the talker solo. I headed home to put a sick baby down for a nap and within 20 minutes I received a call from the therapist tell me that they had called Dynavox two times but were still having a hard time tracking the talker to Makenzie's eyes. She was convinced that the talker needed to be re calibrated because Dynavox's tech support told her so during one of the calls to them but after talking her through a few things I was able to explain that the problems they were having was not calibration issues but instead Makenzie's position in relation to the talker. It was in that moment I realized there was no more room for compromise. Today we met with the AT team. The meeting was scheduled at the IEP meeting in order to set up the rolling mount to begin the "trial". I went in planning to make myself heard in a way that could not be ignored any longer. Before we started I told the team that there was going to be no rolling mount trial. Instead a mount needed to be acquired that would attach to the hi-low chair so that Makenzie could have adequate access to her voice (talker) and that this request was not negotiable.... period. I think I was heard this time...... loud and clear. This is a picture that was taken of Makenzie reading her letter of the week book to her friends after they had read their book to her! AMAZING!!!! The theme of this week has been the winter cold. I am pretty sure we have not had a cold this bad around our house for several years. I got the cold last week on the day we left for camp. Makenzie got it on Saturday while at camp and Mr 14 got it this morning. The crazy thing is that Makenzie and I are still fighting to get over this cold. There was a day not to long ago that the smallest of colds would stop Makenzie in her tracks. I would cause her to cough and choke. Her gut would slow down to the point that almost no food could be given for days and then after the cold was gone it would take weeks to get her back to full feeds. Then after a week or so it would take antibiotics to clear the residual congestion. Often times we ended up in the ED and have even taken a ride to the hospital in an ambulance in the middle of the night after Makenzie could not handle all of the extra secretions. Fast forward to today. Makenzie is and has been on full feeds. We have had a couple of episodes with vomiting because of gagging on mucus but nothing to write home about. Makenzie is cough lake a champ and handling all this cold has thrown at her. She has healed so very much! As much as I hate to see my baby girl not feeling well, watching her conquer tasks like coughing and swallowing just makes my heart sing. Seeing her ability to ride of the storm of sickness makes this mommy feel free from the worry each little sniffle used to bring. I am so proud of my girl! I have however not sent her to school this week because I know Makenzie is under the weather and the congestion has still not let up completely. It has been a really nice week hanging out with Makenzie at home. It has made me remember why I spent last year homeschooling her. I really love hanging out with my girl! However going to school is the right thing for Makenzie right now so on Monday it will be back to the grind and going to school with our friends! In other non sick related news, Makenzie will be getting her power chair on December 5th! I am so excited for her!!! I can't wait to see the look on her face when it comes driving through the front door! Now we have to start getting arrangement made for the bus to pick it up so Makenzie can have it at school. This will be an uphill battle seeing as how Makenzie does not ride the bus and will not be riding the bus with her power chair. I have faith that it will all work out! It is now time to lay down the laws for the sleep over that has transpired at my house tonight because there is no school tomorrow for Veterans Day. Send me prayers for sleep tonight! I am going to need them! Thursday we headed up into the land of no cell phone service, as a family, for a long weekend at an Augmentative communication camp. We had done this before in the spring but Makenzie got sick and we had to leave. So we were all excited to go again hoping and praying that all would be well and we would get to stay for the whole weekend. When we got up there we all ate dinner and then the adults headed to a training and the kids stayed with the camp counselors for activities. As we were finishing up for the evening Makenzie puked everywhere. I was feeling some deja vu coming on. After the nurse from the camp came to check her out and finding Makenzie to have a low grade fever and a pulse ox of 87 we decided to give her a bit of oxygen. Low and behold Makenzie was just fine for the rest of the weekend. I am very sure at this point that Makenzie is very sensitive to elevation changes. Vomit, fever, and low pulse ox are all symptoms of altitude sickness. The treatment is fluids and oxygen which worked and made Makenzie good as new. The idea of this camp was to train parents on communication with a device. We talked a lot about strategies and ways to take our children to the next level in communication. It was so much fun to see Makenzie use her talker in a social setting. She did GREAT and my heart just swelled every time she was able to communicate with an appropriate answer or statement. We are working on putting more vocabulary into Makenzie's device because she is already growing out of what is currently in there. It was also very nice to meet other families who also have non verbal kids. The boys really took it all in. I do not think that they have ever seen another child besides their sister talk with a talker and they did a great job modeling to and playing with Makenzie and the other kids at camp! I really did learn a lot and the kids had a ton of fun! Some of the activities involved goo, paint EVERYWHERE, zip line (yes Makenzie participated) horseback riding, throwing food, silly string, acting out a book, making pizza, a fort ball fight, and a Halloween/birthday party. This camp was put on by Children's Hospital and held at an Easter Seals camp ground. The food was great, the counselors where beyond amazing, and the lodging could not have been more comfortable. We had a really great week and hope that we can participate in one of the camps offered there this summer as well! A huge thank you to everyone involved in making this such a wonderful weekend! I left this camp with so much excitement of all this things Makenzie can learn to communicate not only to me but also to everyone in her community! New tools and idea and the opportunity to go back and learn even more tools to help Makenzie grow! Exciting stuff! About a month ago Makenzie's name was finally at the top of a waiting list for a medicaid waiver in our state. This waiver offers medicaid to children based on their need instead of their parents income. It also provides services to these children that are not covered by medicaid. It took a bit of time to get letters of necessity submitted but Makenzie's additional services are all finally coming together! This week she had her first Music therapy session. She LOVED it! Makenzie loves music and getting to strum a guitar, play the maracas, pound on a drum, listen to a rain maker, and dance to Sugarland, is right up her alley! She will also be receiving massage therapy once a week in our home starting next week. They have paid for a year pass to the rec center for water therapy, and hippo therapy is also covered. The waiver also covers some respite and when I find some hours in the day and someone I trust to hang out with Makenzie we will be taking advantage of that as well. I have also been de-cluttering our house in effort to prepare for a company to come in and help clean one a week starting tomorrow morning. This is also paid for by the waiver. This is one of the services I was most happy to see available! LOL! It makes me feel better about life because if they are offering it on a waiver that tells me that I am not the only one that struggles with the constant juggling of all of Makenzie's needs and the needs of my home at the same time. Obviously this is a need many others have! We have also submitted a letter for help modifying our bathrooms to make one accessible for Makenzie. We will be converting two smaller bathrooms into one large bath with a walk in shower, accessible tub, vanity and toilet. The waiver will pay up to $10,000 once every 5 years to assist in home of vehicle mods. I am so excited to get this done! I am so thankful that our early intervention worker MADE me fill out the paperwork for this waiver years ago. I was still in denial and told her Makenzie would not need something like this because she was going to be healed. Don't get me wrong..... Makenzie has been healed and I am so grateful for her continued healing but these are all things that she that she needs for her independence and the health of my back! On a side note, tomorrow after school my whole family will be heading to a camp for kids who talk with technology. We are so excited and pray for health and safety. I feel like I am getting a cold and Makenzie was a bit more refluxy today. Last time we tried to go to this camp we ended up leaving less then 24 hours after we got there because Makenzie spiked a fever. Pray that we all stay well, that we meet some amazing people, and that everyone stays safe. Oh and one last thing......... 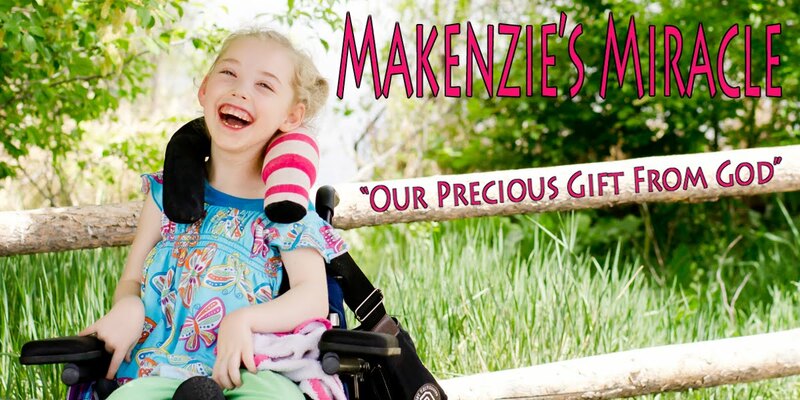 I got a letter from the insurance company today..............Makenzie's Power Wheel Chair has been APPROVED!!!!!!!!!!!!! God is so dang Good!